As the Chinese proverb says “The journey of a thousand miles begins with a single step”. The journey that started with Ibn al-Haytham experimenting with his Camera Obscura in the eleventh century was completed eight hundred years later by James Clerk Maxwell and Heinrich Hertz. While Maxwell laid down the mathematical framework that described the behavior of Electromagnetic waves, Hertz conclusively proved the existing of these invisible waves through his experiments. There were several scientists on the way that played a crucial part in development of this Electromagnetic theory such as Gauss, Faraday and Ampere. Then there were others such as Huygens, Fresnel and Young who worked on nature of light, which was not known to be an Electromagnetic wave at that time. Once the theory of Electromagnetic wave propagation was in place there was rapid progress in many fields, particularly in wireless communications (wireless telegraph, radio, radar etc.). Maxwell’s equations that were proposed in 1861 were initially quite circuitous and were not well accepted. But later on these equations were simplified into the form we now know by Oliver Heaviside. There are still two popular forms of the equations, the integral form and the differential form. We present the integral form of these equations in this article as it is more intuitive and is also easier to represent graphically. The differential form requires understanding of the concepts of divergence and curl and we skip it in this article. The main take away from these equations (presented below) is that a changing Electric field produces a Magnetic field and a changing Magnetic field produces an Electric field. Another important result is that magnetic monopoles do not exist (simply put a magnet, however small, always has a north and south pole). The dot product with a line segment means that only that component of the field vector is effective that is along the line segment. On the other hand the dot product with a surface means that only that component is considered that is perpendicular to the surface (since the unit vector of a surface is perpendicular to the surface). It means that only those field components are considered that are going perpendicularly in or out of the surface. 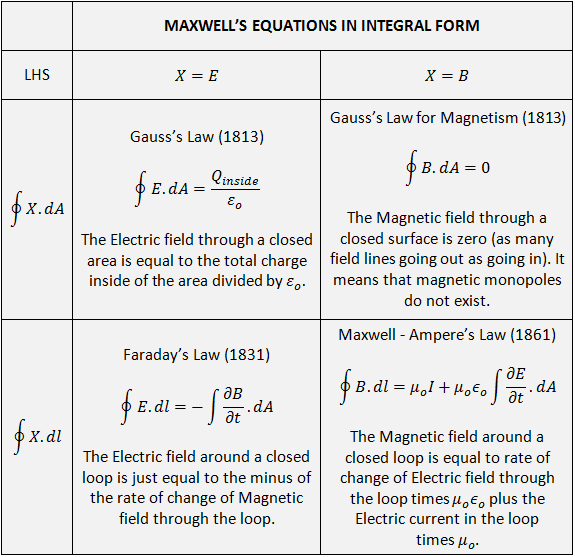 For more on history of Maxwell equations visit IEEE Spectrum and for a detailed explanation of the various forms of the Maxwell’s equations visit this page. In modern Electromagnetic simulation software the differential form is preferred and the algorithm used is called Finite Difference Time Domain (FDTD). However, if the area of interest is quite large (with respect to the wavelength) then the FDTD method becomes prohibitively complex and another method known as Ray-Tracing is used. Please do check out the Ray-Tracing engine that we have developed. Ray-Tracing is becoming increasingly important in RF Planning of Telecom Networks.